In Phildelphia nurseryman Thomas Meehan’s magazine Gardener’s Monthly of 1876 we read what an important figure English gardem writer John Claudius Loudon (1783-1843) was to American landscape gardening. 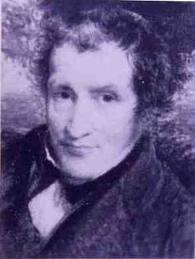 New York nurseryman and landscape designer Andrew Jackson Downing frequently mentioned his ideas came from the writings of Loudon. Downing was America’s most important landscape designer in the nineteenth century. Hovey recognized the role that Loudon played in the evolution of the American garden.